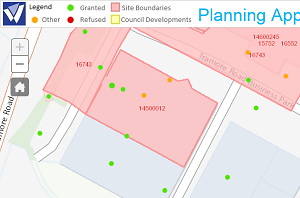 Planning Applications are viewable by Map or Text. 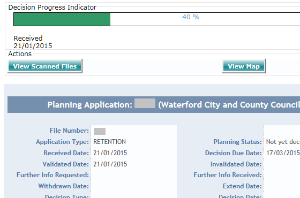 In the case of former County Council applications, online versions of all planning applications received from 1st January 2004 are available to view. In the case of former City Council and Dungarvan Town Council applications, the same applies from 1st January 2006 onwards. Please note, there may be a delay between the lodgement date of the application and the availability of the scanned application. Please note that planning application details are normally registered within 24 hours of being received and can be searched for using this facility by entering the development address. The full planning file is available for viewing on the web approximately two weeks following registration. For information about the retrieval of physical files, please click here.